This entry was posted on June 4, 2013. Bookmark the permalink. Amongst the drug deals, wafts of urine, and jarring fights about who knows what emanating from the streets of the Tenderloin, I entered into a moment of peace where all of the clamoring commotion disappeared for an instant. On my bike and halted at a light where Market Street meets McAllister, a father and his daughter crossed the street right in front of me. With her hair pulled up and tightly twisted in pigtails, the little girl glanced over her shoulder just before entering the depths of the Tenderloin. Our eyes locked. I winked and gave her a smile, precipitating a tooth-filled grin so large that the little girl had to stop walking to give it all of her effort. Moments later we were both jolted back into the chaos. 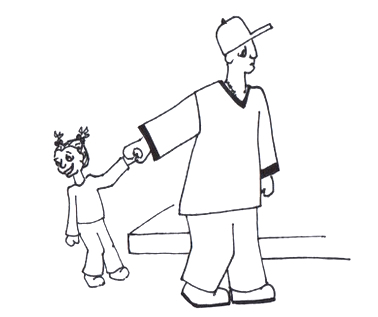 The dad tugged his daughter’s arm, reminding her that they were in the middle of the street and they needed to pick up the pace. The light changed seconds later—I took off, headed back home, and the little girl and her father walked further into the wilds of San Francisco.